The University of Oregon Ducks Men’s Track and Field Team made another positive move toward a second-straight NCAA Division I championship Thursday when decathlete Dakota Keys wrestled his way up from fifth place to third with a total score of 7863, just short of his personal best of 8,086. Keys overcame recent struggles in the pole vault to clear 4.50 m., placing eight in the event and keeping himself in the running. He finished the day with a pack-leading throw of 64.12 m. in the javelin and a 4:29.33 in the 1500 – and earned an additional two points against the Track & Field News form chart. One plus one is two. Added to the one point over the chart that the Ducks scored Wednesday, the Ducks have gained two points on the projected margin. 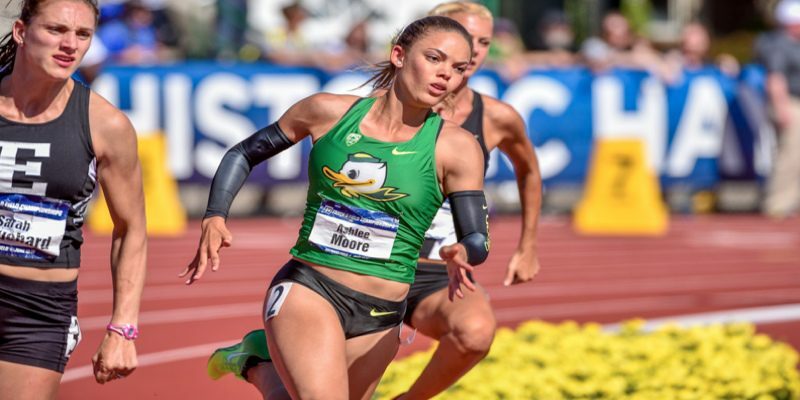 Track and Field News projected Oregon as a two-point favorite over Florida and the Ducks are poised for further improvements in Friday’s events. Johnathan Cabral (110 hurdles) and Marcus Chambers (400m.) ran strong in Wednesday’s semifinals and appear positioned to finish higher than the 5th-place finishes T & F News projected. 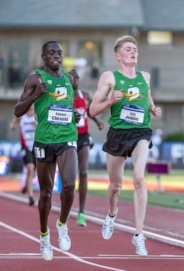 T & F News also predicted that Edward Cheserek and Eric Jenkins would go 1-2 in the 5K and the 10K. They pulled it off convincingly in the 10K Wednesday, toying with the field before pulling away together with 1200 meters remaining. That aside, Daniel Winn qualified for the final with a solid second-place finish in his heat and Blake Haney and Johnny Gregorek went 2-3 in the second heat. Oregon could outperform the form chart by two digits in this critical event. At this time it appears that the Ducks are pulling away from Florida, which is performing at form T & F News form level. LSU and Texas A&M were projected six points behind the Ducks and have lost more ground than they’ve gained. The situation for the women is more complex. T & F News projected seven teams to score between 40 and 48 points, with USC at the top and Oregon a point behind. Each of the top seven teams had its wins and losses Thursday. For the Ducks. The 4 X 100 relay got things off to a good start qualifying for finals in fifth-fastest at :43.49, but lost momentum when Sasha Wallace (100 hurdles) and Jasmine Todd (100 meters) both narrowly missed qualifying from finals. It was a loss of eight points against the form, seemingly fatal for such a close meet. Jenna Prandini ran a strong 100 to advance to the final. But then good news came in from the field. Jillian Weir finished fourth in the hammer (66.74 m.) and Brittany Mann threw the shot put 17.22 meters for a fifth place finish. Four of the eight lost points were regained. Prandini, the only athlete in the meet to be competing in four events, left the crowd wondering if she was biting off too much when she bailed out on her first long jump and put a fourteen footer on the books. She went on to a jump 6.80 m. for a second place finish and Todd was just behind in fourth with 6.65 m., regaining another two points against form. The deficit was down to two against form. Raevyn Rogers won the slower semi-final heat of the 800 in 2:06.94 and Prandini advanced in the 200 with a fourth-fastest :22.46. Nikki Hiltz slipped into the 1500 on time with a 4:18.26 effort. T & F News does not expect the Ducks to score in this event. As predicted, the 4X400 relay did not advance to final, but the Ducks got the biggest boost of the day in the 10K when Molly Grabill finished fourth in 33:26.61, just ahead of Waverly Neer (33:26.98). At this point, the Ducks are seven points over the form, which projected them at 47 points. Grabell was not predicted to place in either the 10K or the 5K. Her performance in the 10K makes the 5K appear a likely candidate for her to score more points. USC, projected at 48 points, lost six points on form by not advancing runners in the 200 and 400 meters, and advanced only one runner instead of two in the 100. As expected, the Trojans did not score the first day, and their championship bid is in trouble. Texas A&M is in better shape. Projected at 46 points, the Aggies gained a point in finals completed Wednesday. T & F News projects them to win the 4X100 relay, the discus and the 400 hurdles, so those events provide no room for improvement. The Aggies also made finals in the 4X400 relay and qualified two runners in both the 100 and 200 (one more than projected in each). Arkansas, also picked to score 46 points, is in trouble. The Razorbacks had a net loss of three points in finals completed today. They also lost two points by not advancing in the steeplechase final Saturday. They advanced in the 400, 800 and 4X400 relay, as predicted, and also have a runner in the 5K. They would require some superb performances in their remaining events to get back in the race. Georgia is out of the running. Florida is five points down from its projected 45 and Texas is three down on its projected 44. At this point, the race appears to come down to Oregon and Texas A&M. The Aggies could lose points in the discus, 4 X 100 and 400 hurdles, and could make gains in the 100, 200 and 4X400 relay. The Ducks could gain in the 5000 and could gain or lose in the high jump, 4X100 relay, 200 and 800. That, in a nutshell, is the meet heading into Friday and Saturday finals.